Williamsburg hand made oils are made with the finest quality materials available. Each color is ground to enhance the beauty and luminosity specific to that particular pigment. Some of our paint will feel slightly gritty; some, extremely smooth. Our Cerulean Blue will have a beautiful, velvet, light-absorbing surface with an extremely strong covering power; our siennas will often be chunky or gritty to allow light to travel through the vehicle, exposing rich golden or mahogany undertones instead of just heavy, dull browns. Our pigment is ground in pure, premium, alkali-refined and PH- balanced linseed oil and made in batches no larger than five gallons at a time. This gives us total control over the product, much like the late nineteenth-century French colormakers. All the materials are handmeasured, and every ounce of paint is scrutinized. The paint is packed in 40 ml and 150 ml non-reactive aluminum tubes. Larger quantities of paint are packed in aluminum cans. We use only the purest materials. 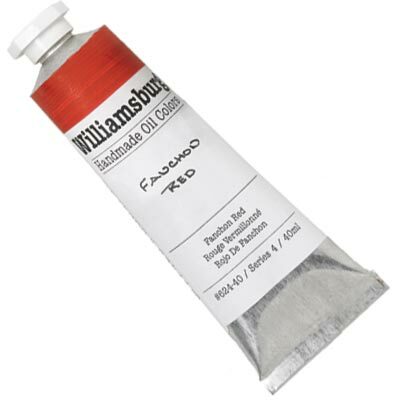 Williamsburg oil colors are used by the world,s finest artists. You can see them in recent acquisitions at the Metropolitan Museum of Art and MOMA in New York, the National Gallery of Art in Washington, and the Beaubourg in Paris.